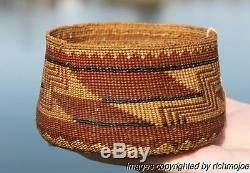 This is one of three masterpiece baskets that we're listing this week. 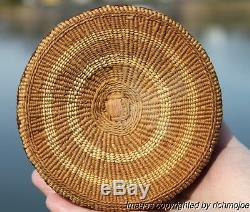 A very fine stunning rare form early masterpiece of Northern Californian basketry originating from the Hupa, Yurok, or Karok tribe and dating from the very early 1900's. 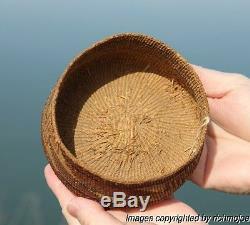 This fine miniature hand woven basket is very finely woven from split willow shoots, woodwardia, bear grass and maiden hair fern to produce the stunning intricate designs that surround the periphery. The design features some rare and striking complex geometric featuring central stacked trapezoid forms with an inner step pattern, and a saw tooth design at the top rim edge. 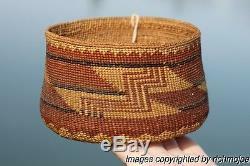 The basket makers skill is clearly evident in the miniature form, fineness of the weave and pattern balance. Great balance between positive and negative spaces has resulted in a true masterpiece. 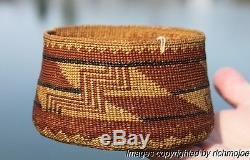 The basket measures 4 1/4" in Diameter and stands just 2 1/2" tall and is in excellent condition with no splits damages or repairs noted. 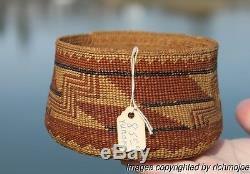 Old tag reads " Yurok 85.00". 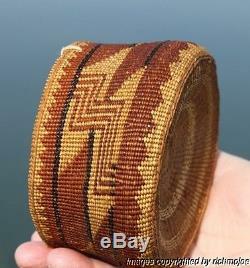 T his is an excellent stunning finely woven masterpiece. 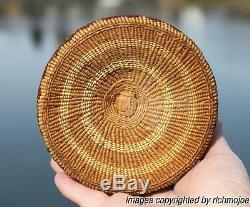 This stunning complex museum quality basket displays very well and will make a fine addition to anyone's collection. Please check out other current offerings including a great Tlingit, Haida argillite and Kwakiutl totem poles and some great early Inuit carvings. More than just a pretty picture. 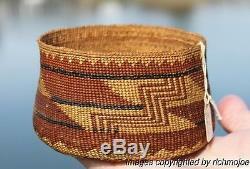 The item "VERY FINE OLD NORTHERN CALIFORNIA HUPA YUROK KAROK INDIAN BASKET c1900" is in sale since Monday, January 18, 2016. 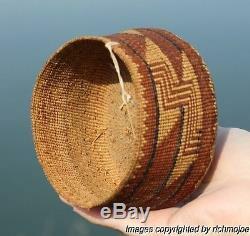 This item is in the category "Collectibles\Cultures & Ethnicities\Native American\ US\1800-1934\Baskets". 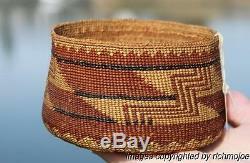 The seller is "richmojoe" and is located in Northwest Coast. This item can be shipped worldwide.